You can share files with members of your group. All files added to the group will be accessible to all group members. In Group Navigation, click the Files link. Once you click the Files navigation link, you will see where all the files are located for the group. Click the Upload button to add new files to the group. Find the file you want to upload to the group. Click the Open button once to upload the file. 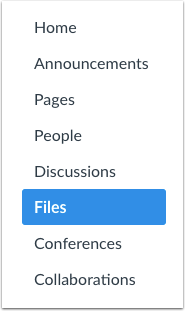 Once you upload the file you selected, it will show up in the Files section of the group navigation. This way all the group members will be able to access the file. Previous Topic:How do I create a group as a student? Next Topic:How do I start a collaboration in a group? Table of Contents > People and Groups > How do I upload a file to a group?